Maria was just getting in her car to go to work when she heard the familiar cry of her cat, Tommy Socks. Tommy Socks, who was named by Maria's three daughters, is a one-year old gray tabby with white socks, and he is a very friendly and laid-back boy. Maria looked around and did not see him at first, but his cries eventually led her eyes upward where she spotted him 30 feet high in a very tall tree just on the other side of the fence. Maria called Animal Control for help or advice, and they referred her to me. 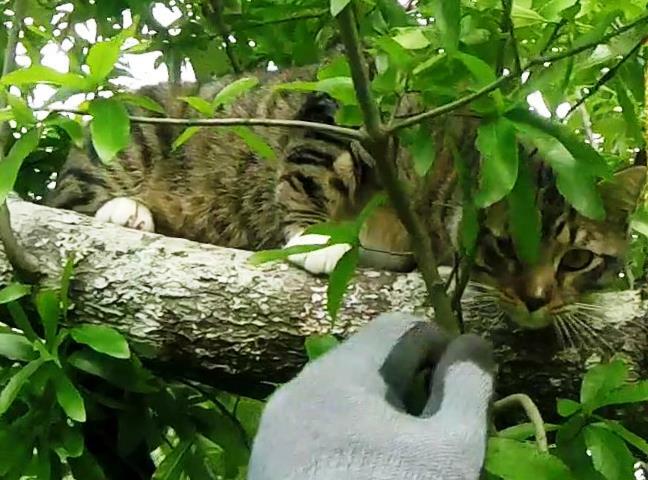 When I arrived, Maria pointed to Tommy Socks up in the tree, but he was a little difficult to see, since his gray body matched the gray bark of the tree, and he was partly hidden by the foliage. He was on the lowest branch this tall tree had to offer, and he continued to call out to us. Maria assured me that he was friendly and relaxed with strangers, but I held on to a certain amount of skepticism since I never know for sure how a cat will react to me in a tree. 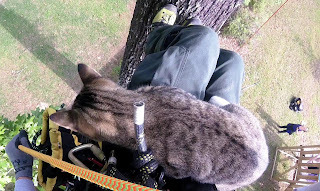 I set my rope about 20 feet above him, and Tommy Socks watched this activity with interest. He did not seem to be disturbed by it and possibly even wanted to play with the rope. That was a good sign, so I was getting hopeful. I climbed up to him, and he had little reaction. I stuck out my hand to him, and he sniffed it routinely. I petted him, and he was perfectly comfortable with me. He was so satisfied that I was friendly, that he started to step up onto my shoulder. I was very amused by this, but I had to stop him before he put his back end on my shoulder. I gently picked him up and put him back on the branch, but I was very pleased to see that he was so friendly and relaxed. Yep, this boy should be an easy rescue after all. I pulled up my carrier and placed it in front of him, but he calmly backed away. I put the carrier away and pulled myself up a little higher. I could see that he wanted to get in my lap, so I brought my lap a little closer to him so that he could easily step onto it. He took advantage of the opportunity and readily stepped onto my lap. I petted him while I debated about going down with him in my lap. He was certainly calm enough, and except for a few fronds of foliage to push through, the trip down was obstacle-free. He also knew where he was and how to go home, so I decided to go ahead down with him in my lap. He continued to remain calm and looked downward as the ground came closer and closer to us. When we were about six or seven feet from the ground, he walked out my legs toward the trunk of the tree, grabbed the tree and tried to go down the rest of the way head-first. He jumped most of that distance to the ground and began looking for an opening in the fence to get to the other side where his home was. He trotted down one side of the fence while Maria followed him along the other side. He found an opening in the fence and trotted into his yard with Maria following him. Maria, her three daughters, and Tommy Socks were all very relieved. After getting Tommy Socks settled back into his routine, Maria went on to work, and I packed up and left.